During its upgrade of both Sea World & Aquatic theme parks, Rangeline successfully executed a full line stop enabling both parks to remain operational. Rangeline and its professional team successfully executes a full 36” Line Stop service during its upgrade of both Sea World & Aquatic theme parks. These upgrades occurred while both parks remain open and running as normal. This critical operation involving some of the world’s largest aquariums theme parks required professionals. The goal was to isolate one of two separate storage wet wells while the other one remained in operation. This 36” PVC line needed to be isolated and diverted through a line stopper by-pass outlet and into a wet well located adjacent to the wet well being worked on. To begin the project, the Rangeline technicians installed and tested a 36” line stop fitting. After this process, a 24” isolation valve was installed and prepared for a hot tap to be preformed. The hot tap itself was made vertically so that it could gain access more accurately into the 36” force main. A 24” hot tap machine made the tap and the cutter was retracted and then was depressurized and removed safely. Next, the coupon was retrieved from the shell cutter and accurate measurements were made to be used on the stop folding head Line Stop head found on the 36” line. This stopper would fold up and pass through a 24-inch hole later opening into the 36” pipe. The process continues with the line stop machine placed on the isolation valve itself and secured properly into place and the 24-inch by-pass piping is attached next to the Line Stopper. Once this piping is installed properly, the isolation valve itself can be opened and product will begin to flow. 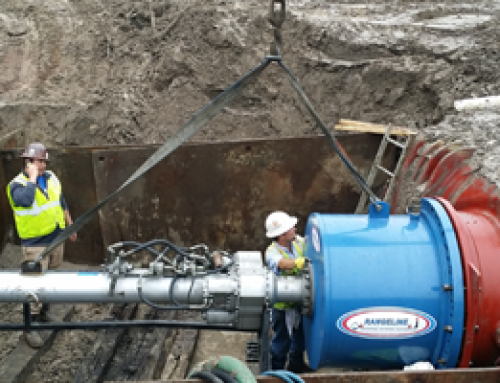 After the flow is secured, a folding head line stop head inserts and isolates the 36” main. This line stop head’s main job is to divert the flow until upgrades can be made there to the wet well. Ultimately, all of these tasks were achieved without any interruption to the system while both theme parks remain operational. The project was performed safely, properly and with high-quality materials that will last. For more information on line stopping or hot tapping services for the business, visit their official website at www.rangeline.com. Rangeline Tapping Services is a Line Stopping, Valve Inserting, Hot and Wet Tapping Company that performs their high-quality professional services throughout North America. Their professional piping solutions offer both daily and emergency projects for either small or large-scale projects. Rangeline and its professional staff use only the latest state of the art equipment, which allows them to work across the country on projects of any magnitude for any type of client. Visit http://www.rangeline.com for more information.